When cult writer/director John Waters was growing up in Baltimore in the sixties there was a local TV program which showcased the most beautiful teenagers in town demonstrating the latest dance crazes like The Roach and The Mash Potatoes. It was required viewing for any kid wanting to keep their finger on the hip pulse. However, it only allowed thin, white teens into the fold – fat kids, coloured dudes and freaks like Waters need not apply. So when he decided to celebrate this chapter of his childhood, he hit back by making his heroine chubby, her friends black and her mission in life to integrate everyone into her favourite show, ‘The Corny Collins Show’. Talk show hostess Ricki Lake was plucked from obscurity to play Tracy Turnblad, the starry-eyed centrepiece of the fairy tale. Water’s high school friend and oversized transvestite muse, Divine, played her mother Edna (a role that John Travolta has now bravely taken on in the remake). Debbie Harry donned a series of outrageous wigs for her part as the villain Velma Von Tussle, and Sonny Bono came onboard as her racist husband Franklin. Waters also popped up as the psychiatrist brought in to cure Tracy’s best friend, Penny Pingleton (Leslie Anne Powers), of her fondness for funky black music. And Elvis look-alike Michael St. Gerard doused himself with unhealthy quantities of aerosol to play heart-throb Link Larkin. 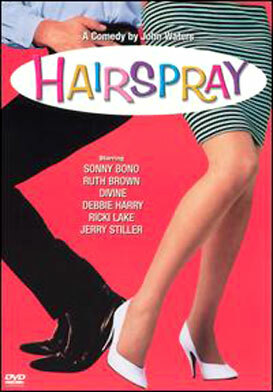 Shot on location in Baltimore with several scenes set along Eastern Avenue, or “Hairdo aorta” as Waters calls it, Hairspray is a camp nostalgic romp with a feel-good happy ending that was denied the real life segregated television show. It’s no wonder this old chestnut was dusted off and turned into a Tony Award winning musical and now a third incarnation as an all singing all dancing motion picture.